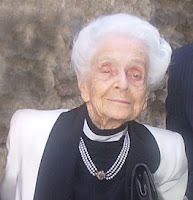 Times Online has an interesting article about neuroscientist Rita Levi-Montalcini, who tuned 100 on April 22. She has lead - or I should say is leading - a fascinating life. Levi-Montalcini enrolled in medical school at the University of Turin in 1930 over her father's objections. The initial obstacle to entering university was not Fascism, but her father. In her autobiography she writes that she and her twin sister Paola (an artist who died in 2000 and whose artworks decorate her office walls) were born to Adamo Levi, “an electrical engineer and gifted mathematician”, and Adele Montalcini, “a talented painter and an exquisite human being”. She enrolled anyway, earning her degree in medicine and surgery in 1936. She wasn't sure if she wanted to pursue neurology research or focus on medicine, so she chose to enroll in further coursework to specialize in neurology and psychiatry. When the British and American armed forces forced the Germans out of Florence in 1944 she was hired as a physician to minister to a war refugee camp, which housed Italians who had fled the continued fighting in the North. When the war was over, she and her family returned to Turin where she resumed her academic position at the University. But her life was to change once again. In 1947 developmental biologist Viktor Hamburger invited Levi-Montalcini to join him in his lab at Washington University in St. Louis. She had intended to stay there for 10 months, but actually ended up remaining there for 30 years. She was hired as an Assistant Professor in 1956, and promoted to Full Professor in 1958. While she made her home in the US she didn't neglect her Italian roots: in 1962 she established a research unit in Rome, splitting her time between there and St. Louis. And in 1969 she became the Director of the Institute of Cell Biology of the Italian National Council of Research. Although she officially retired in 1977, she never actually stopped working as a scientist. Five years ago she founded the European Brain Research Institute (EBRI) in Rome. That is, in fact, where she spent her 100th birthday, attending a conference on "The Brain in Health and Disease" held in her honor. She also has been working for social change. She (with her sister Paola) also founded the Rita Levi-Montalcini Foundation, which focuses on the education of girls and young women in Africa. In 2001 she was appointed an Italian Senator-for-life, a role she actively serves which she actively serves "unless busy in academic activities around the world"
And what is her secret to such a long and active life? She gets up early in the morning, eats very little, and keeps her brain active. She also supposedly doses herself every day with nerve growth factor eye drops, which may or may not have had a positive effect. She has also seems to have been blessed with general good health. She has lived an amazing life, and shows little sign of slowing down. We should all be so active when we hit the century mark.